This may indeed be the coolest pic I've seen here to date! It has everything going for it - the space age font for the incredible looking sign, a beautiful suuny day, a beautiful happy shiny family with full shopping bags, a spotless family automobile, and a Kresge store that serves as a background for the entire ensemble! Life doesn't get any better than this! That is a great sign. The mall is still there but it's sort of run down and not in a very good part of town. There are no major tenants and it caters to an urban crowd. Back in the 60's though, it was one of the major malls in Kansas City. Wow, that's a lot of bright blue!!!! I think I just got blinded. And the family is so cute all dressed up to go to, as what Mike referred to it as, a rundown place. It is very depressing hearing that current desciption considering how beautiful the picture is. The husband with the suit on though has to be my favorite. I can't even get my fiancee to go out to a nice resturant in a suit let alone the shopping mall. It definitely wasn't run down then. My mom used to go there with her friends all the time when she was growing up. That sign on the postcard is long gone but there's signage on the other side of the mall with the same lettering style. Swanky signage, cool vintage car and a happy 1950s/1960s family. What more can one ask for? BTW, what is "urban" supposed to be an euphemism for in this context? Poor, non-white people? Actually, the neighborhood is fairly racially mixed. It's in an older part of the city that has seen better days. There are much worse neighborhoods in KC. I didn't mean to imply anything when I referred to it as urban. I am completly smitten with this photo! I so want to be able to just walk into that scene and have a look around. With my camera, of course. I can attest to Mike's comments about it being in a not very good part of town. I moved out of the area 4 years ago because of an increase in crime including my own home. I loved going to the Landing as a child and playing on the animal statues that use to be inside and throwing coins in the fountain. One of my favorite shops was Topsy's a local popcorn and icecream shop. They have the best cinnamon popcorn and cherry limeades! Of interest is that the building to the right of the photo that is white was a Macy's and when Dillard's bought Macy's in the 80's it became a Dillard's but was quickly shuttered. the nuclear family, the cool car, the clear blue skies , and even the Mall entrance sign is pretty cool.. man , you cant get any more cheery than that. in today's somewhat depressing post-911 world, i'd rather we had a lot more imagery like that. we really do need to recapture that 50s/60s optimism. 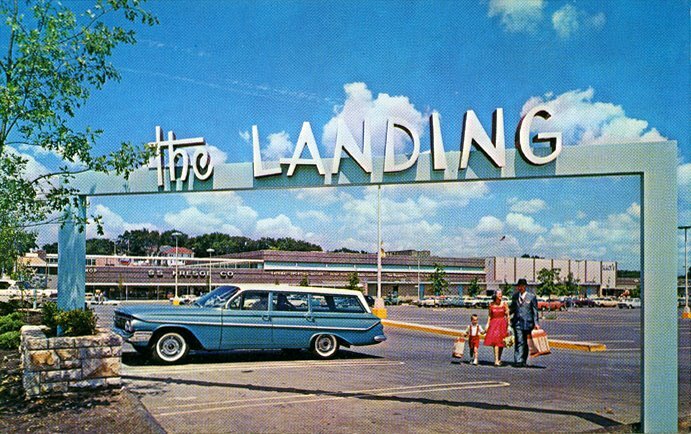 that was when the landing mall was the king back then. man i can get paid to dump macy trash! most the old sign are still up! accept they change the name To The New Landing Mall. I still live right close the street from the mall! Yell! has it up and down for the past couple years. it still the only mall in kc that still open late on christmas eve in some case Intel midnight. it still famous for it black SANTA CLAUS and it racially mixed. My family moved about 3 blocks away from the Landing, on Rockhill Rd., in the mid-sixties. I got to see it uncovered and covered. There were many cool stores, and I got many pairs of shoes from the Steves Shoes. Most of my clothes came from the Macy's there; too. The high school across the street(I graduated from there in 1980), was Bishop Hogan...the Rams, and they always posed the cheerleaders on the Ram statue. Gateway Sporting Goods, Musicland, SS Kresge, Cakebox bakery, Merry-Go-Round clothing...it had everything I needed as a kid in the 70's and VERY early 80's! There was a barber shop on the North side, an office supply store near the barber. It was just a cool place to go before the "suppermalls" started sprouting. The Landing sign in the postcard was there long after the mall went bad, if I had known then what I know now about "googie", I would have taken photos of all the signs there. Great memeories of The Landing as a kid. We lived in Independence, so going to The Landing was a real treat! We always had lunch at The Seafood Cafe...the BEST clam chowder ever. Plus, they had Manhattan (red) clam chowder, too. Cake Box Bakery, Musicland (where the last 45 singles I bought was Earth, Wind & Fire's "Boogie Wonderland", Macy's, the animal statues in the main mall, and the Russell Stovers store that sat in the parking lot. Mom would wear her mink fur and go with Dad to the swanky "Leather Bottle" restaurant that was upstarirs where the video store last was. It was a J.C. Nichols mall, the same people who developed Kansas City's Country Club Plaza. Ah, better days! I grew up there in the 80's. I lived on 56th Euclid. Me/ my friends used to walk to the landing all the time. The music store, foot locker, Kressge, Payless shoes, Harold Penner, etc. I remember hanging out at the arcade break dancing. But around the late 80's, I avoided that place. I'd stop in briefly, but never hung out there anymore. And I usually had a gun with me even then. Always wondered if I'd be safe walking back to my car. Broken glass and trash in the parking lot, etc. I remember the Landing well! I worked at the Steve's Shoes in the mid 60's. The animals in the mall were safe and kids played on them while parents shopped. The mall started out open to the elements--stores on two sides of walkway. They covered it later so it became an "inside" mall. Interesting the mall style is back to "outside" strip malls now. Christmas at "The Landing" was "the" place to shop. It has been a while since I was in a mall. The last time I was watching a movie with my family. Since I got everything for the on-line retailers I don't do my shopping on malls. Sweet memories of a kinder/gentler time. I attended Bishop Hogan High School across the street from the Landing/graduated in 1967. My boyfriend/later husband worked in the stock room at Macy's. I wonder what happened to those animal statues that were there. Great pictures, I remember my grandfather telling me about this mall. The Landing also hosted the Dancing Waters that had backed up a certain piano player (Liberace)at the New York Worlds Fair. Nothing like a warm evening with water misting all around ;-). Shopped at the Landing as a child with my mother. There was a huge Noah's ark, raccoons on tree stumps, a whale, a swan, giraffe, and other statues. I think some of the statues are now on the Plaza during Easter. Used to be a pleasant place to shop in the 60's. Great Work nice blog. I love reading it. Keep sharing this type of stuff on your blog. I have great memories of The Landing. My dear old dad was the manager of the Racket Merchandise store there. A lot of fun things to do at that mall in a simpler time. I really cherish those days, like working the tables at the sidewalk sales. Those really were the days. I remember the Landing. I graduated from Bishop Hogan, in 1987 & me & my friends were their everyday at Music Land grabbing all the latest Whodini, New Edition & Michael Jackson albums, 45's & then the Cassette tapes! We saved our lunch money for Topsys popcorn to eat while lounging on the animals in the center of the mall..great times! "Go RAMS"
To Anonymous, I remember the Landing very well. My mom worked at the Racket Store. I remember those animals too. What I remember most was one day we were walking home from school and went in and there was a stage and Buffy from Family Affair was there. 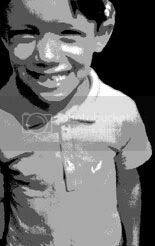 Annisa Jones if I remember right. She just was on stage and we were all screaming. I got a signed pic and a kiss. She would be dead at 18 or so. Great memories. I know I have some Landing pics somewhere!!! I miss shopping there with my family growing up. I really miss the Cake Box Bakery! It was incredible! They had the best butter cookies in the world! I saw Paul Revere and the Raiders play in the parking lot once. And Russel Stovers had a white building on the corner where they made and sold their delicious chocolate confections. Thanks for the trip down memory lane! When was there a Fountain in the Landing Mall?? Are any other stores that u czn remember? Was there a pizza place there? Use to be a great place to shop like the Bannister Mall, until people moved in those areas and started committing all the crime. Bannister mall and Super Wal-Mart and a lot of other stores and restaurants left those areas and the Bannister mall and surrounding stores for several blocks were torn down because people stopped shopping at them because of all the crimes from robbery to murder committed by African Americans!!!!!!!! !